If I've said it once I've said it a million (ok, maybe 3) times... A drive can take you amazing places. On the way back from fishing Mom said something about, "That's the woods where you girls grew up." My mom and Jim built a house in the woods when I was just a baby and we lived there until I was 11. It was an amazing house and I have so many memories there (that I'll share another time). Dad said, "Wanna drive by?". I was sure Mom wouldn't want to because I'm sure it doesn't hold nearly as many good memories for her as it does for Laura and I. But she said sure. So we turned down Galvin road and took a quick trip down Memory Lane. First house on the street used to be a house trailer in a woods. We weren't allowed to go there very often, but when we could get away with it we loved it! They had a real woods, the kind you could almost get lost in, and as kids this was just the type of off-limits place where we were dying to play. The trailer is gone, and it's a house now, but the woods looks the same. What memories. On the other side of the woods was the Snyder house. We got to play here a little more often than the woods. Leigh would sometimes invite us over to her house to play video games in her living room (and by video games I mean Atari) and sometimes we'd go play in the barns - completely against the rules. Sometimes her cousin Kristi would come play too. Now there's a new house on that side of the street that wasn't there before. It looked odd, out of place. Next came Troy White's house. He lived on the same side of the street that we did. We weren't supposed to play with him, but I'm not sure why. he had a big Doberman and he liked to ride a dirt bike. He was a rebel I guess. 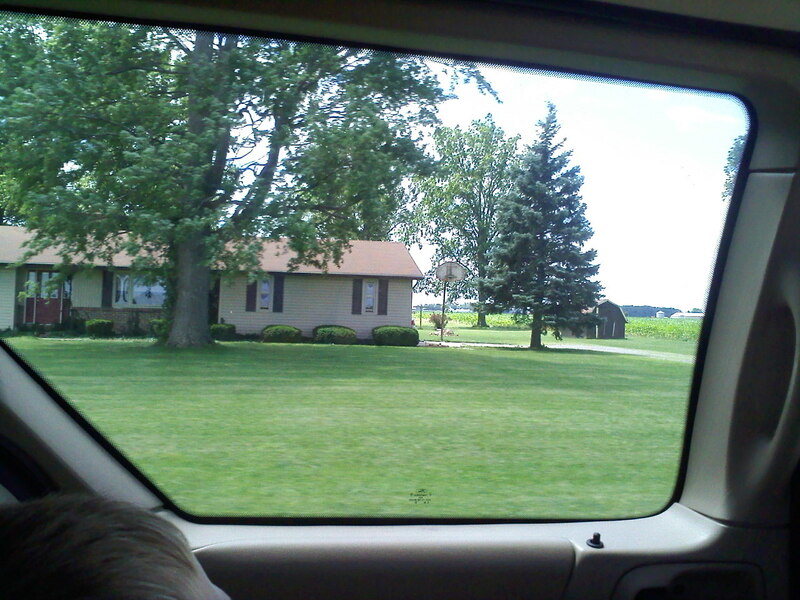 After the big cornfield was our house. It's grown up quite a bit since I lived there. Often when you go back to a place you knew as a kid it seems so much smaller, because you were so much smaller... but this seemed so much bigger. I couldn't see a lot of the places where I made so many memories, but I could see the front porch where Mom took "first-day-of-school pictures before I got on the bus, and the front yard where we played kickball (great thing having a big family - enough for kickball teams) - "Across the road is a homerun!" I tried to snap a picture as we drove, but it was a blur - metaphorically so I suppose. I'll probably go back someday to take some pictures that do it justice, that help me retell more of the story of my childhood. Last house on the block, the Wolfram's. This one I did get a picture of. I remember many things about Bob and Barbara Wolfram. Barbara was my fifth grade math teacher. Bob tended a giant strawberry patch and let us come and pick buckets full. (Hey, I wonder how he kept the rabbits out? Maybe he had so many strawberries that a few rabbits didn't matter.) The Wolfram's took care of our pets when they wandered over into their yard (or house). The Wolfram boys put up with us throwing mudpies from our playhouse at them as they mowed the lawn. They were a special kind of neighbor, the kind I don't think exists much anymore. See that tree in front? I toilet-papered that tree during a birthday party. Fun story. My mom finally let me have a birthday party sleepover. I invited all of my friends - 10 maybe. But someone else decided to have a sleepover on the same night so I think only 2 girls came. I was disappointed, but we made the best of it. I even let Laura pretend to be one of my friends for the night. Mom had us all change into PJs before she went to bed. 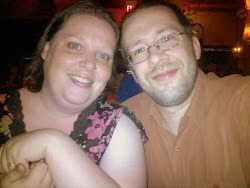 We stayed up late watching Friday Night Videos (this was before MTV was around), and when the channel went off the air for the night (yes, they used to do that) we put our jean jackets on over our flannel nightgowns and headed out with a package of toilet paper to the Wolfram's. We were sure they would catch us because they had one of those newfangled motion sensor lights that kept going on and off. Oh yeah, back to that tree... I threw a roll of toilet paper up and it got caught in the tree, and instead of just leaving it there I decided I could knock it out if I threw my jean jacket up at it. So then the toilet paper was free and my jean jacket was caught in the tree... kids just never think things through properly do they? The best part of this story? The Wolfram's paid Laura and I to clean up the toilet paper mess the next morning... I still wonder if they knew it was us. Fishing is not boring anymore! Grandpa asked the boys if they wanted to go fishing today. They seemed only mildly excited about the idea. Ethan complained that it is boring because he never catches anything. Grandpa assured them that this would be different because he was taking them somewhere special. We loaded up in the van and took quite a drive. I worried that the boys would get restless as the trip took longer and longer, but they were troopers. (It really wasn't that far, 15 minutes maybe, but with a creek within walking distance I didn't understand why we were going so far away.) But Grandpa was right, this place was different! 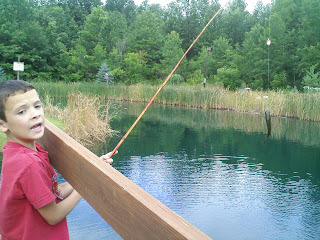 The pond was so well stocked that you had a fish on the hook before you could even lower it into the water! I think each of the boys caught more than 10 fish. 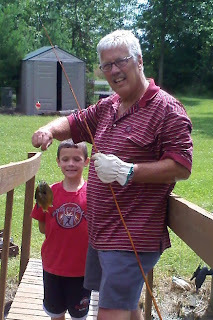 Then Grandpa asked them, "So what do you boys think about fishing?" 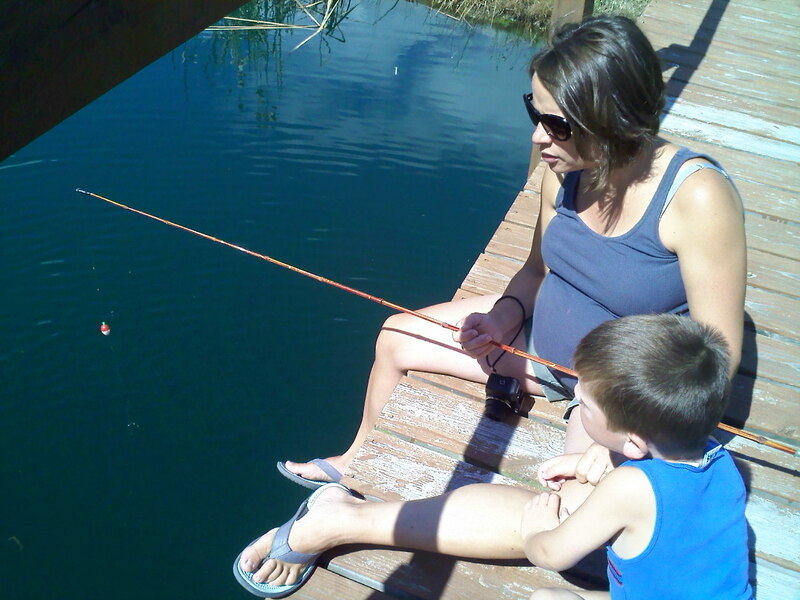 and Ethan said "Fishing isn't boring here. This is the best vacation ever!" 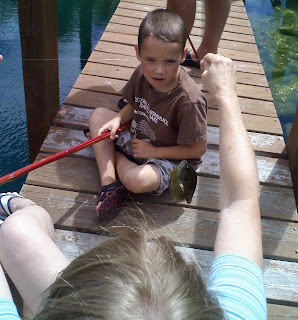 We discovered it was better for Issac if he didn't fish with bait. He was terrified of the fish once it got reeled in, and nearly went off the side of the dock into the pond several times. We stayed up past midnight doing what?? 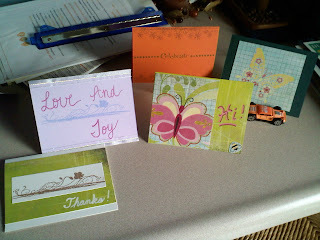 So my creative passion is card-making. It started several years ago when some friends invited me to a Stampin' Up! party. I quickly became obsessed and well, the rest is history. But Christina has always been fascinated. As I've said before I don't get to visit my family nearly as often as I'd like, and the visits are never very long. 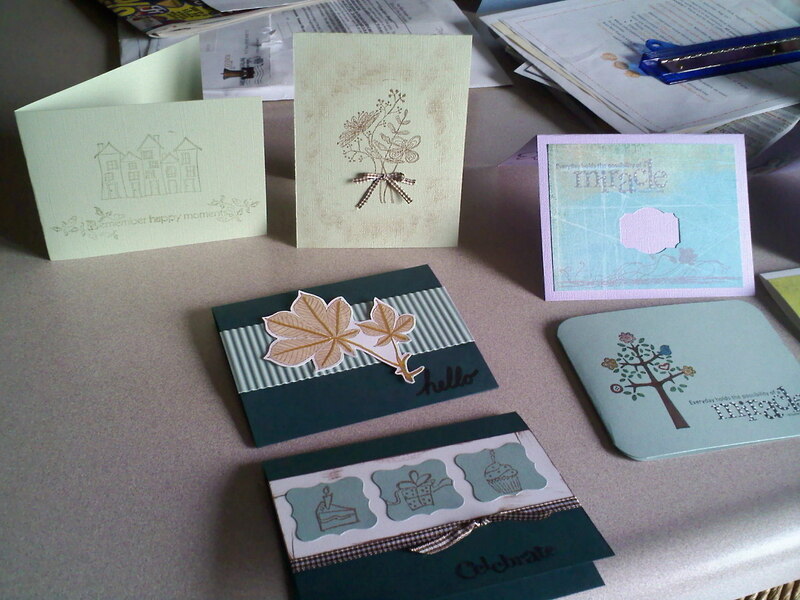 Well Christina has started asking me to bring things to make cards so she can do it with me. So even knowing I was only staying 2 short days and that a lot of the time was spoken for with activities, I still dragged along my gigantic tote of supplies I sometimes take when I'll be away from home for an extended period and need a few creative accessories to help me pass the time. So after getting home from Girl's Night at 10:30 I asked Christina if she was tired and when she said no I got out the tote and took over Mom's dining room table. Laura and Christina jumped right in, Mom had to be convinced. She didn't join us for about an hour. But we sat making cards together until 12:30. I've never gotten to share this passion of mine with my family except by giving them cards. It was so amazing to sit and be creative with them. Laura made 4-5 cards, Christina made 5 cards (and 6 more today), I made 4 that I left for Christina to give to friends, and Mom made 2. It was the best ending to girl's night I could imagine. I may be the stamper, but he's the one who allows me to spend all of my hard-earned money on creativity! I am a teacher and a wife from Ohio who enjoys trying to be crafty in what little free time I have. Where I visit for inspiration! If You're Looking For Me, I've Moved!